Icy cold covers much of U.S.
(CNN) -- A blast of Arctic air Tuesday morning has much of the nation -- from the Great Lakes to Oregon and down to Texas -- in its cold, icy grip. 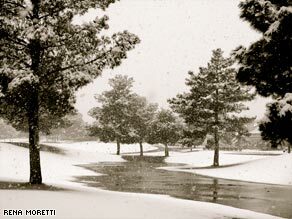 Snow covers a golf course in Summerlin, Nevada, near Las Vegas, on Monday. The temperature at International Falls, Minnesota, was 26 below zero at 8 a.m. Tuesday, the National Weather Service said. To the south in Minneapolis, below-zero temperatures were leaving roadways covered in black ice, sending drivers spinning into numerous accidents, CNN affiliate KARE-TV reported Tuesday. Black ice, nearly invisible on roads, can form when car exhaust freezes on snow-covered pavement in sub-zero conditions, KARE said. Twin Cities drivers could find a little hope in the day's forecast high -- 4 degrees above zero by the afternoon. Temperatures hovering as low as 23 below zero have parts of Montana frozen in their tracks, according to CNN affiliate KFBB-TV. The forecast high Tuesday for Great Falls: 5 degrees. WFAA-TV in Dallas, Texas, predicts the temperature will barely get above freezing, to 36 degrees, on Tuesday. A winter weather advisory is in effect for northern Texas. Ice storms, blizzards pound U.S. In Las Vegas, Nevada, residents saw a rare snow accumulation. Snow-covered grounds were a treat for iReporter Rena Moretti, who's lived in Las Vegas on and off for about 10 years. While the snow is forecast to end Tuesday, the cold air mass should stick around all week. The station also warned commuters that driving would be a mess Tuesday morning. "We've had people that have been trying to make it here ... either have been too intoxicated or just too cold and just fallen down and haven't been able to make it," says Siena Francis House worker and guest Jerry Rayburn. According to the National Weather Service, the entire state of Iowa could be in for heavy snowfall Tuesday. Chicago, Illinois, no stranger to cold weather, is expecting a high of 22 degrees with snow, according to WGN. Meanwhile, on a frontal boundary, West Virginia and western Tennessee are on the alert for possible freezing rain, the weather service reports. And KATV in Little Rock, Arkansas, said freezing rain and sleet were moving across the state. In New England, socked by a powerful ice storm last week, temperatures were warming back up into in the 40s and 50s, WCVB in Boston, Massachusetts, reported. But electricity may not be restored to some customers until the weekend, the station reported. One town, Lunenberg, Massachusetts, said school students would be getting an extended Christmas break, with classes not resuming until the new year, WCVB reported. Debris-clogged roads were blamed. "They're passable for vehicles and emergency vehicles, but they're not passable for buses. That represents a danger, so, we can't get the kids safely to school, even if we were able to open school," School Superintendent Loxi Joe Calmes said, accoding to WCVB. Where is it not so cold? It was 69 degrees in Miami, Florida, early Tuesday morning, according to WFOR. The price for the warm weather -- possible thunderstorms, says the National Weather Service.